If using classic crust: Heat oven to 425°F. Spray or grease 12-inch pizza pan or 13x9-inch pan. Unroll dough in pan. Starting at center, press dough to edge of pan. If using thin crust: Heat oven to 400°F. Spray or grease 15x10-inch or larger dark or nonstick cookie sheet. Unroll dough on cookie sheet; starting at center, press out dough into 15x10-inch rectangle. Top dough with provolone cheese, cutting to fit. 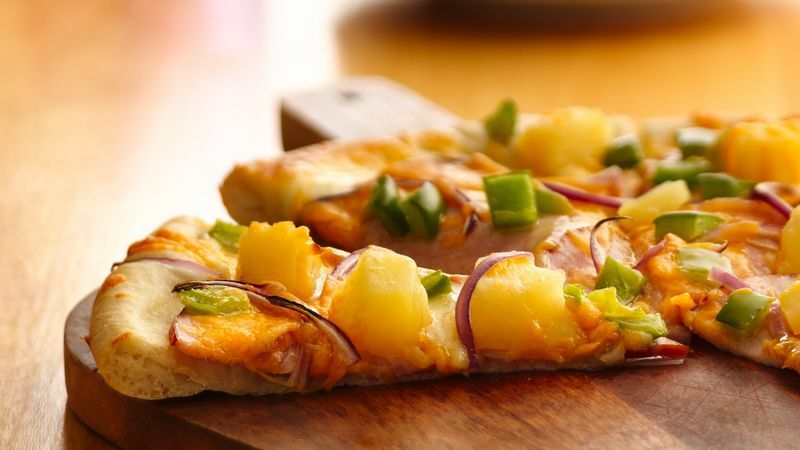 Arrange Canadian bacon, pineapple, onion and bell pepper over provolone cheese to within 1/2 inch of edges. Sprinkle with Cheddar cheese. Bake classic crust 16 to 20 minutes, thin crust 10 to 14 minutes, or until crust is deep golden brown. Cut into 8 servings. Tip if using classic crust: For a crispier crust, prebake crust 6 to 8 minutes or until crust is set and dry, then add toppings; bake pizza 12 to 16 minutes.